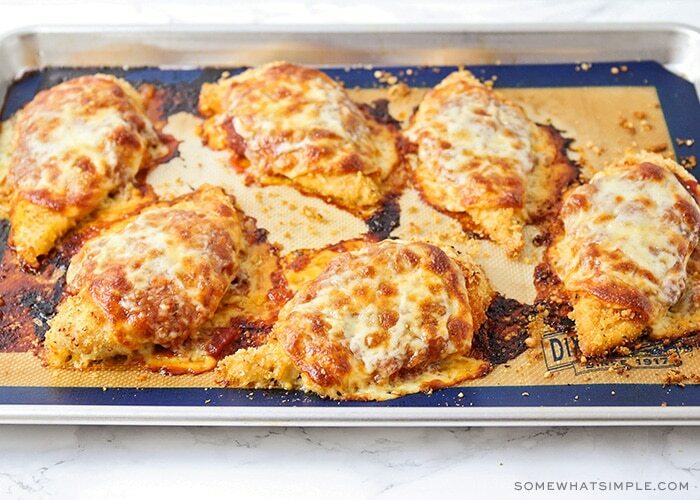 This easy baked chicken parmesan recipe is so simple it’s ready to eat in about 30 minutes. 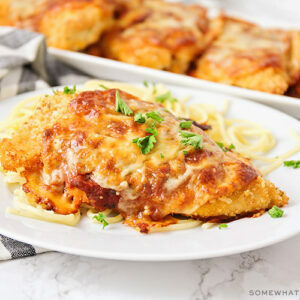 Made with tender chicken breasts and topped with melted cheese and a warm marinara sauce, this recipe is loaded with flavor and will quickly become one of your favorites! Who else loves a delicious chicken dinner? My family eats chicken for dinner at least 3-4 days per week, and it’s always a favorite. 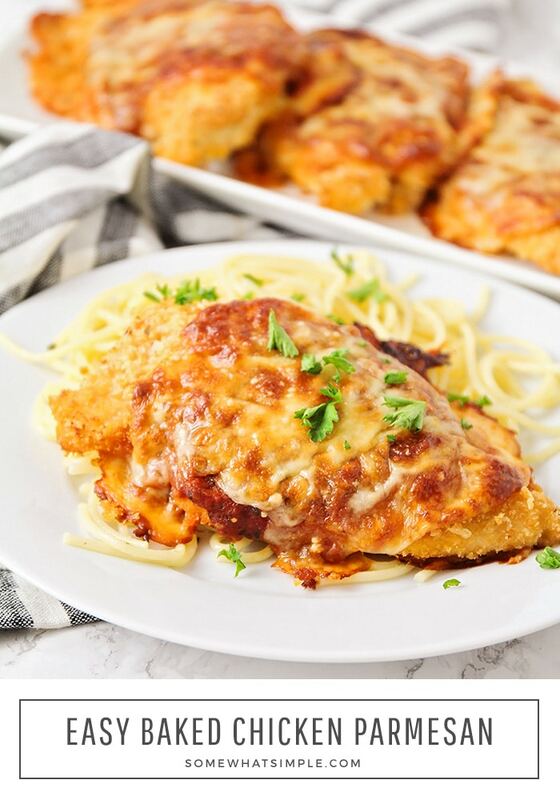 Since we eat chicken so often around here, I’ve developed a wide variety of main dish chicken recipes – Chicken and Mashed Potato Bowls, Chicken Enchiladas, Easy Chicken Tettrazzini, and this easy chicken parmesan recipe are a few of our favorites! I’ve always loved ordering chicken parmesan at restaurants, but I was really surprised at how easy it is to make at home! 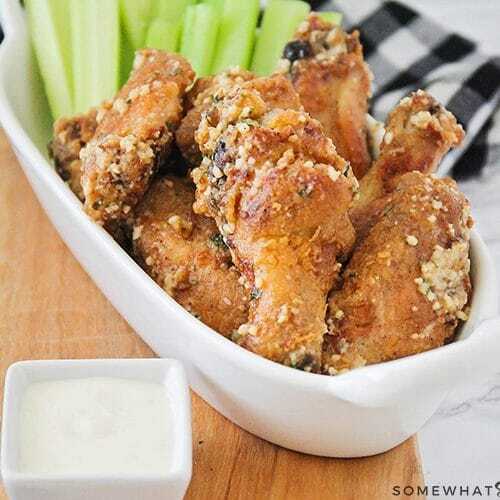 It’s so cheesy and flavorful, and has a classic combination of flavors that never disappoints. It’s perfect for a simple and tasty weeknight dinner! I made my homemade version as easy as possible to make, with store-bought marinara sauce and sliced provolone. It still tastes like it took all day to make, even if it only has a few minutes of hands-on time! 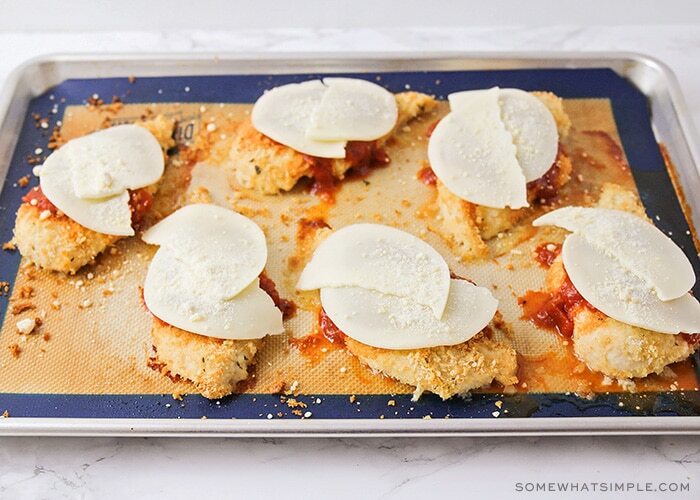 Making this baked chicken parmesan is way easier than you might think! I’m sure there are a wide variety of chicken parmesan recipes, but I love making it my way because it’s simple, easy, quick, and delicious. Those are all the things I’m looking for in a weeknight dinner! You’ll start by cutting your chicken into six thinner fillets, then dredging them in a mixture of flavored panko and regular bread crumbs. 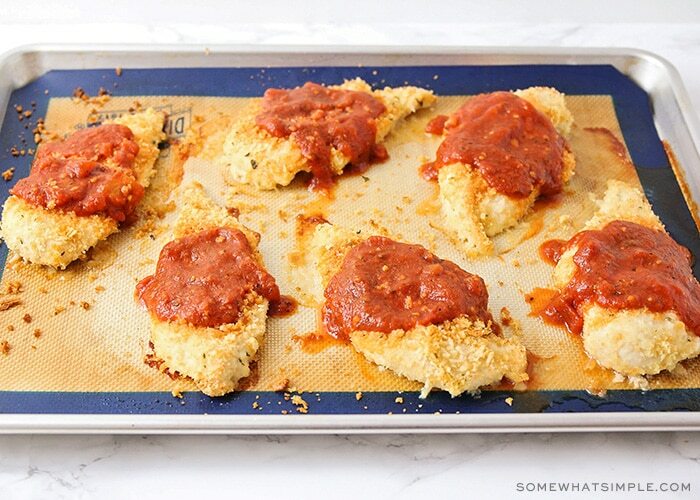 Bake the chicken in the oven until it’s golden brown and crispy, then add some marinara sauce to the top. I like to leave the ends of the chicken uncovered, so I can still enjoy a bit of the crispy coating. Next, layer a slice of provolone on each piece of chicken, then sprinkle parmesan cheese over the top. Return the chicken to the oven, and bake it until the cheese is melted and bubbling. So yummy! I like to serve this baked chicken parmesan with spaghetti noodles, and a green salad on the side. 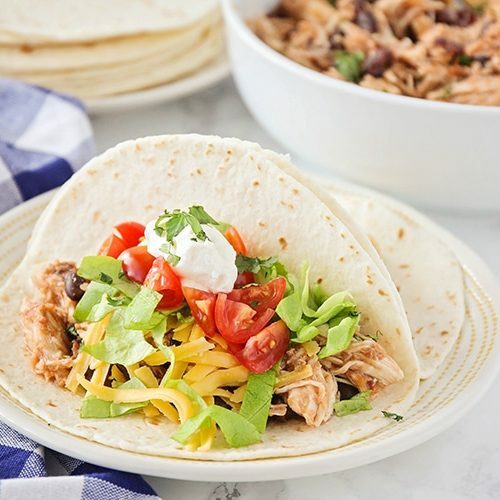 It’s a delicious and flavorful weeknight dinner that’s easy to make! You’ll want to preheat your oven to 400 degree F and bake for 20-25 minutes. When the chicken has turned a golden brown color and has a crispy texture, that’s a good sign that it’s done. You can cut a small slice in the chicken and if the juices are a clear white color than it’s been fully cooked. If you want to be extra sure, you can use a kitchen thermometer to see if the internal temperature has reached 165 degrees F.
Yes, you can definitely freeze this recipe and save it for later. Once the chicken has been fully cooked, let the tray completely cool before tightly wrapping the baking dish in plastic wrap and foil or placing them in freezer bags. While the chicken is still delicious after it has been reheated, you do lose some of the crispness after it has been frozen. 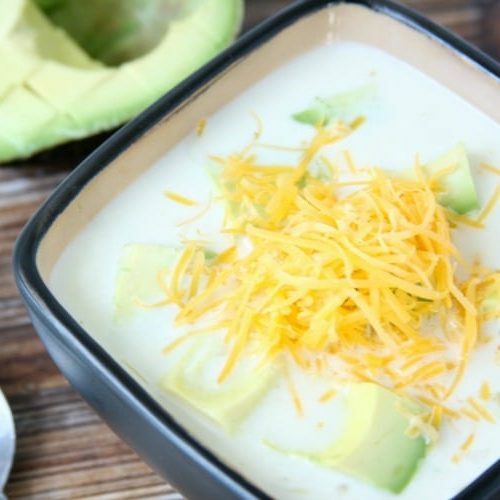 Now that you know how to make this simple recipe, it’s time to give it a try! Leave us a comment below and let us know what delicious fruits you used or tag us on social media because we love to see what you’ve been up to in the kitchen! 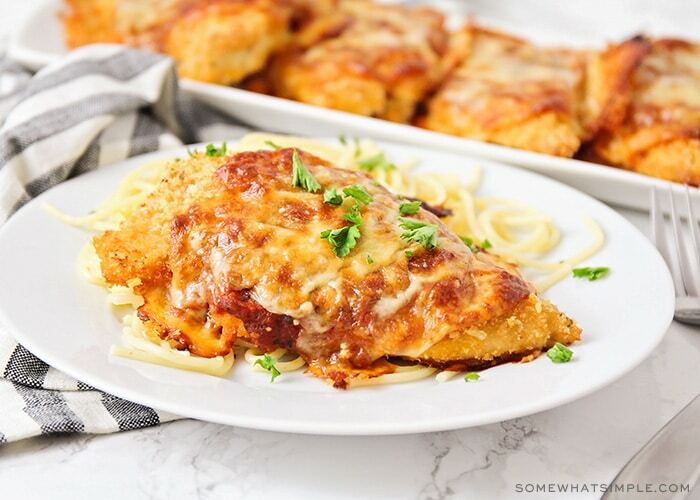 This easy baked chicken parmesan is so easy to make, and totally delicious! It's ready in about 30 minutes, and incredibly flavorful! Preheat the oven to 400. Line a baking sheet with parchment or a silicone liner, then spray with cooking spray. Cut each of the chicken breasts in half horizontally to form two thinner fillets from each breast. Drizzle the fillets with the olive oil and toss to coat. In a shallow dish or large plate, whisk together the bread crumbs, panko, salt, parsley, basil, and garlic powder. 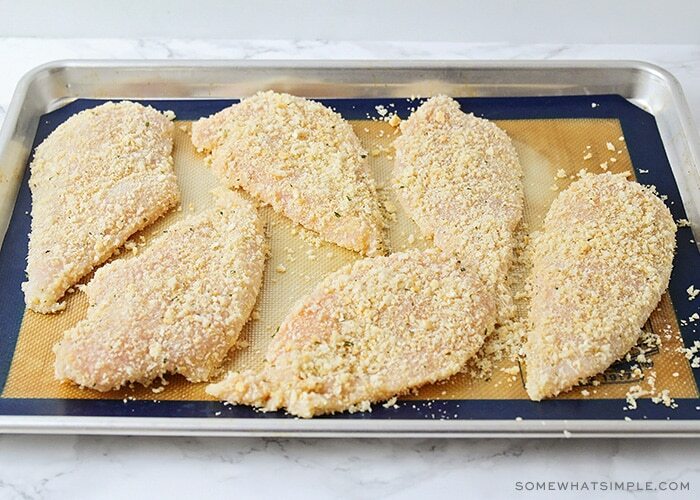 Dip the chicken fillets in the bread crumb mixture, pressing gently to coat. Place on the prepared baking sheet, and spray the tops with cooking spray. Spread a few tablespoons of marinara sauce over each chicken breast, and top with a slice of provolone cheese. Sprinkle with the grated parmesan cheese. Return to the oven for 10 minutes, or until the cheese is melted and bubbly. Serve hot. Gotta love restaurant style dinners that are easy to prep and taste amazing!!! This was such a delicious dinner! This looks so full of flavor! Thank you for an awesome recipe. Trying this this week. This is one of my all time favorite meals! I love that this version is baked, so I can make it at home! This is one of my favorites too! So glad to hear you enjoyed it! Dang delicious! That’s what this is! So good! 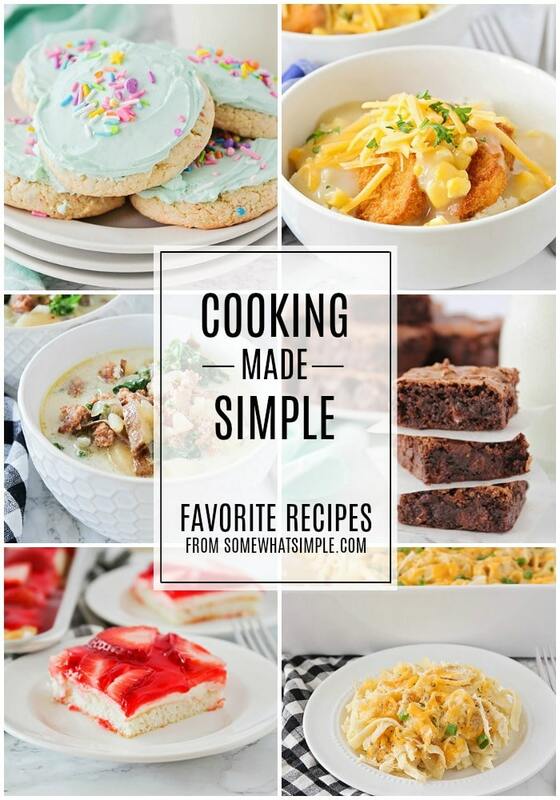 So glad you loved it…it’s one of my all time favorite recipes! Oh my word, this is delicious and SO easy!